A kitchen is the heart and soul of any home. But because we know that every home is completely unique, you need a kitchen that’s custom designed to meet the needs of your household, at a price you can afford. Translating your ideas and needs is key to creating a stylish and personalised space that you and your loved ones will enjoy. 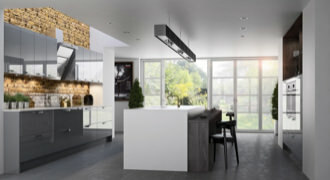 Fortunately, our incredibly skilful design team specialise in making kitchen dreams come true: simply tell us your big idea and we’ll make it happen. Using the latest kitchen design tools, we build your kitchen using the best quality materials and the highest standard of workmanship. So, no matter what fixtures, fittings, or custom features you settle on, one thing you can be certain of is a stunningly high-quality end result. 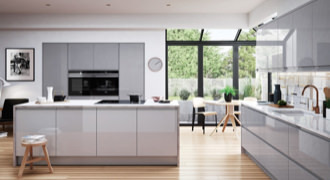 So if you’re dreaming of a new kitchen that will make your home and your life so much better, contact our expert kitchen design team today to arrange your FREE home design visit: and let’s start making your dream a reality. With innumerable options for the layout, cabinets, countertop, tiles and backsplash, settling on a kitchen design for your Belfast home can be a daunting process. Classic, country, modern or traditional—which one is right for you? Understanding the different styles will help you pick the best one for your lifestyle. Classic kitchens: A perfect balance between traditional and contemporary, classic designs have a timeless look that is always in style. With a neutral colour palate and minor detailing, this style suits a variety of tastes and budgets. Contemporary kitchens: Inspired by the modernist style, contemporary designs often incorporate traditional ideas for a sleek look. Focusing on clean, simple lines and high functionality, these kitchens typically include tall cabinets (with few handles) and long islands that provide ample work space. Visually stunning natural stone and state-of-the-art technology gives them a luxurious feel. Country kitchens: With an emphasis on creating a warm, cosy space that family and guests will love, country-style kitchens incorporate natural wood cabinetry and furniture with intricate carvings. Décor is characterised by pleasing colours and patterns as well as old-fashioned ornaments for a traditional, lived-in feel. Modern kitchens: Bright, bold colours and angular, flowing designs characterise a modern kitchen. Flat surfaces, flush doors and little or no hardware are typical. Cabinet doors may be replaced by frosted glass for a modern look. Use of man-made materials like laminate, ceramics and plastics is generally preferred, though the use of natural stone is not uncommon. Traditional kitchens: In a traditional kitchen, every feature, including the cabinetry, countertop, backsplash and furniture have special touches and are often handcrafted. Soft, muted colours and a celebration of the outdoors with natural materials and nature-inspired patterns give it a feeling of warmth and comfort. 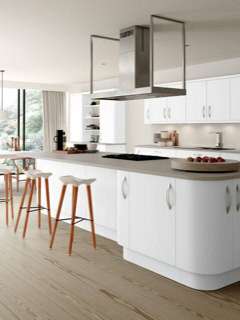 Handleless kitchens: If you are fashionably minimalistic, then a handleless kitchen might be ideal for you. Grooves, push-to-open doors or continuous rails replace knobs and handles for clean look. This type of kitchen is virtually kid-proof as well as more hygienic. Lack of handles minimises your cleaning time. Fitted Kitchens: This formal design typically includes standard built-in cabinets that run from wall to wall. You can customise the look by replacing some cabinet doors with glass or opting for open shelving to display your kitchen treasures. Are you ready to turn your dream kitchen into a reality? You have come to the right place! Simply tell us your big idea and our skilled team will make it happen at a price you can afford. You can be confident that the materials we use and the quality of our workmanship will deliver the results you want. 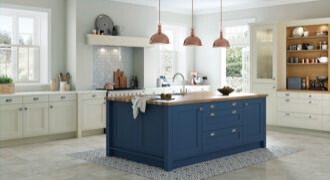 Book an appointment for a free kitchen consultation or request a call back. 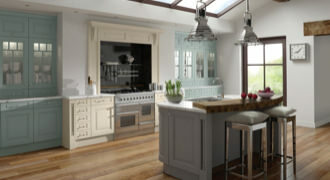 Each of our designers has over 20 years experience of designing kitchens. Factory-made rigid construction - nothing is flat pack with us. Heavy-gauge 2mm PVC edging, 18mm solid backs and adjustable feet for a precision fit. Heavy guage solid metal, soft close hinges and drawers. We partner with the best-known electrical brands to bring you the latest and best appliances and technologies that will make your kitchen the envy of everyone. We offer an extensive range of worktops including laminate, granite and man-made stone. In addition, we have a vast collection of doors and accessories to choose from, in every style and finish imaginable. All our kitchens are tailor-made to order and designed just for you. All workmanship comes with a 10 year insurance-backed guarantee. All carcases, doors and worktops come with a 5 year insurance-backed guarantee. We offer a full manufacturers' guarantee on all electrical appliances we install.